The first in a series of updates about the progress of the Viaduct Rail Park project. Groundbreaking for the Viaduct Rail Park was held on October 31, 2016. The contractor, AP Construction, immediately began to clear the site, removing overgrown trees, shrubs and debris. Construction fences were erected as site clearing continued while awaiting final soils and other environmental reports. In the last few weeks, the contractor has removed much of the ballast on the trestle itself in order to allow for cleaning, waterproofing and sealing the top side of the bridge structures that pass over city streets. Lead abatement will follow on the underside of the bridges, before they are repaired, repainted and relamped. AP Construction is also measuring all components of the existing steel structure in order to prepare shop drawings for the new metal railings that will be installed along the edges of the viaduct as the weather warms. The long-awaited park is a collaboration between the Center City District, Friends of the Rail Park, the City of Philadelphia, and SEPTA. 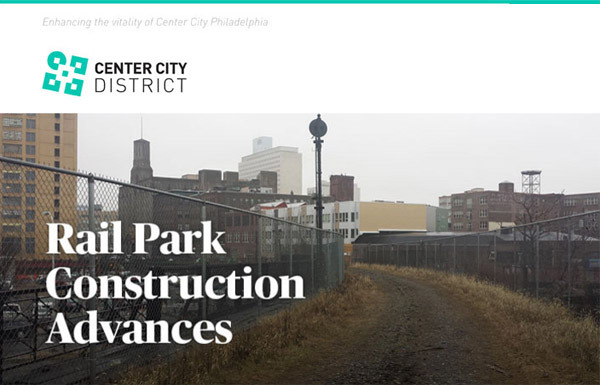 The first phase of The Rail Park extends from the south side of Callowhill Street, curving northwest to grade at 13th and Noble Streets, and includes improvements to the 1300 block of Noble Street to North Broad Street. The project is aiming for completion in February 2018. An overview may be found at centercityphila.org/ccd-services/streetscape/the-rail-park. During the months of construction, the Center City District Foundation is working hard to raise the remaining $700,000 needed to fully fund the $10.3 million project. You can help make this transformative new public green space a reality by making a gift today. Our Rail Park Benefactor Program offers options to support the park and leave a legacy at the same time by naming items such as the park’s swings, tiered seating areas, and hanging planter boxes or adopting a park tree, shrub or bench.